At the age of four, Joe Paris Lee suffered a crisis of confidence as a writer. He was watching his father read a newspaper and he wondered how he was ever going to learn to make sense of those strange marks on the page. Instinctively he knew that without it his writing would suffer. He surmounted this first literary hurdle by going to school, where he immersed himself in such classics as Five Go To Smuggler’s Top, Another Job For Biggles and Bill Speed On Hot Ice. So immersed did Lee become in books, he failed to notice the passage of time from day to night, thus leading to his ability to read in the dark, a skill he would use to good effect when he became a writer who couldn't pay his power bills. It was in high school where his writing blossomed, under the tutelage of English master, Mango Mackerras, who saw talent in his young protégé, where others saw only pimples and big ears. "I particularly enjoyed his Bus Stop piece," recalls Mackerras. "I laughed until I stopped laughing. And I usually don’t laugh at bus stops. Whereas train stations, that’s another matter altogether." Knowing that writing was the only thing he wanted to do in his life, Lee spent the next 40 years avoiding it. 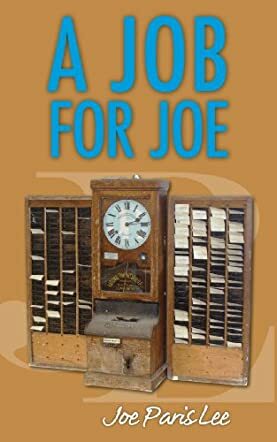 But eventually his fate, out of breath and with blisters for Africa, caught up with him in the form of A Job For Joe, a light-hearted, tongue-in-cheek look at the 56 jobs in 60 years that, up until now, have kept him from fulfilling his destiny as a writer. A Job for Joe by Joe Paris Lee takes a humorous look at Joe's working life. Joe has had no less than 56 jobs in 60 years, something of a record perhaps. A Job for Joe takes us into the roller-coaster ride of his attempts at a “career” or several. Hold on tight as Joe’s coaster crawls its way to the top and then flings its readers into the most hair-raising journey of their lives. Far from being a slacker who cannot hold down a job, Joe juggles his way through a number of different jobs, each one with its own story and each one with the same eventual outcome. Readers, be prepared to be entertained in a seriously big way. A Job for Joe by Joe Paris Lee is one of the funniest and best books I have read in a long time. He is a seriously good writer, very funny and has an amazing way with words. I cannot remember ever having laughed so much at a book. This was one of those 'can’t put down' books. I just wanted to see what scrapes he got into next and I wanted to see what the eventual outcome was. As well as being a humorous look at Joe's working life, it’s also a lesson of sorts – well, several lessons actually. You will find yourself thinking hard in between picking yourself up off the floor from laughing. I would love to read more books from Joe, especially if they are as funny and thought-provoking as A Job for Joe.